I purchased these Oskri bars for myself and the opinions expressed here are my own. The Quinoa Bar didn’t really taste like quinoa. My first impressions were sweeeet, and sesame seeds. 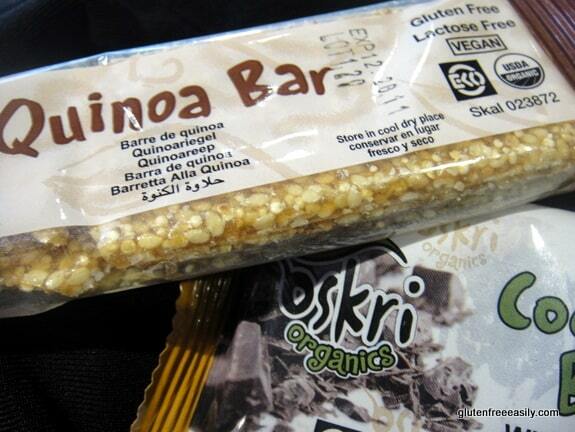 The Quinoa Bars and other Oskri bars are sold on Amazon. On Amazon, the ingredients are shown as: Quinoa (Organic) (Seeds), Sesame Seeds (Organic), Rice Syrup. However—and it’s a big however to me—the actual package for the Quinoa Bar I tasted shows: Rice Syrup, Quinoa 10%, Sesame Seeds, Date Syrup, and that’s what is shown here on Oskri’s site. Of course, Amazon always has the following caveat for any food products sold there: Actual product packaging and materials may contain more and different information than what is shown on our website. We recommend that you do not rely solely on the information presented and that you always read labels, warnings, and directions before using or consuming a product. To complicate things, Oskri shows the ingredients for all of its bars on this page, but they are not necessarily in the order that they appear on the package. The ingredients for the Quinoa Bars are shown as: Sesame Seeds, Quinoa, Date Syrup, Rice Syrup. As I’m sure you know FDA labeling laws require that ingredients must be shown in “”descending order of predominance by weight” meaning that the ingredient that weighs the most is shown first, and so on. As I already stated, the ingredients for the Quinoa Bars are shown on the bar label as Rice Syrup, Quinoa 10%, Sesame Seeds, Date Syrup. However, if you click on the bars themselves and go to the separate page for each flavor, the information shown is the same as what is listed on the bars. Therefore, the information on Oskri’s site and Amazon is both confusing and misleading. Bottom line: The primary ingredient in the Quinoa Bar is the Rice Syrup. Granted rice syrup is an unrefined sugar, but I think it’s important to note that a sweetener is the primary ingredient. And, if the second ingredient is quinoa and it constitutes 10% of the bar by weight, then the rice syrup amount is pretty hefty. Not surprisingly, the Quinoa Bar didn’t really satisfy my need for protein. If you read gfe, you know that I love coconut, so I was excited to try the bar made of coconut and dark chocolate. The ingredients on the label are: Coconut*, Rice Syrup*, Dark Chocolate*, (Sugar*, Cocoa Liquor*, Cocoa Butter*, Soy Lecithin* (an emulsifer), Vanilla*), with * indicating organic). First impression: Not a strong coconut or chocolate flavor. Sweet enough, but nothing exceptional. 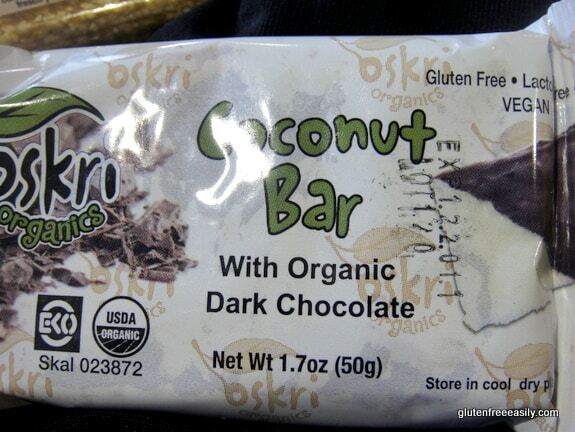 Furthermore, even though the Coconut Bar is labeled “Coconut Bar” and “with Organic Dark Chocolate is shown as a subtitle, you won’t find this bar under Oskri Bars on Oskri’s website or its subcategory of Coconut Bars. Instead it’s shown under Chocolate Bars, and is referred to as an Organic Dark Chocolate Bar. Similarly, there is no category for Quinoa Bars even though “Quinoa Bar” is shown on the label of the bar. Instead, these bars are shown under the Sesame Bars category. More confusion from Oskri. A few more important things should be noted. First, I inquired about the Barley Coffee shown on Oskri’s site, and the potential for cross contamination with the other products that were gluten free. Shirley: All of your bars are shown to be gluten-free on the packaging and on your site. However, you also produce barley coffee. Do you certify your products gluten free through a third-party inspection source like GFCO or via in-house Elisa testing to ensure that no barley makes its way into the bars? How do you ensure that your bars stay gluten free? Oskri: Oskri Barley Coffee is produced at a third party facility, away from the Oskri Bars. Oskri stores the Barley Coffee separate within the facility to ensure that our bars stay Gluten Free. Note that Oskri did not respond to my question on their testing methods to ensure their products are gluten free. I also inquired about the ingredients conflict. Shirley: You list the ingredients of the bars on your site, but I don’t believe they actually are in the order they appear on the labels with the main ingredient first, and so on. Oskri: The website lists the ingredients the same way that they are listed on the bars wrappers. My sampling was a very small one, but I still thought I’d share my impressions on these two flavors of Oskri bars. I also wanted to share my findings on Oskri bars in a general sense … their ingredients, testing, etc. I admit that I’m a tough critic and not a fan of protein bars. Frankly, I still haven’t found one that beats eating an apple and some nuts (or nut butter spread on the apple), but I had neither of those in the Charlotte airport that day. You can also read Amazon reviews for more insight on Oskri’s products. Thanks for the information. That is really interesting about the ingredient lists. I have an Oskri bar in my purse (the cashew one) that I have yet to try. I am interested now to see how it tastes and to check the ingredients on it. I wonder how many other companies have their ingredients listings in conflict … purposely or not. And, if Amazon carries the products, they seem to be just sharing what has been provided by the company. Several of the folks who did reviews on Amazon also noted the discrepancies. My kids like the quinoa bar, sesame and fennel bar, and especially the pineapple coconut bar. I know what you mean — too much sugar for me. I don’t eat the quinoa or sesame one, but I do like the coconut pineapple one. My youngest two take a bar each day for snack at school, but it varies the type (kind bar, larabar, or other). I’d check our packaging, but we are all out right now. Hi Jennifer–Thanks for sharing your family’s experience! Now I’ll have to look up the coconut pineapple one or maybe you can bring one to a support group meeting for a few of us to taste test (only need a small bite, right?). The issue with the ingredients has been noted in the Amazon reviews, too. I guess Amazon does not read those or do any verification of ingredients, but just accepts the vendor’s word; hence, the disclaimer. Great review Shirley! I had wondered about these bars – though I’ve primarily seen them online, not in my local stores. It frustrates me when ingredients, packaging, etc. aren’t consistent as it makes you wonder if you can really believe any of it. I think they should work on that a bit to make the brand more trust-worthy. I’m disappointed to hear that they are so sweet, as the last thing we need here is a ton more sugar and both my husband and I have a major sweet tooth! I agree on the ingredients. First, I’m not too keen on mostly brown rice syrup in several of these bars and then there’s the general inconsistency in the ingredients on Oskri’s website and Amazon. It does make you wonder if any of the info is accurate. How interesting. When I was studying for the bar (no pun intended) exam, I pretty much lived off of larabars (specifically the coconut cream pie — I guess we have the coconut thing in common!) Very few ingredients and (mostly) raw. I didn’t quiz them too hard on their practices, though (and by “not too hard,” I mean “not at all”)! I do agree that the best snack is some fruit and nut butter — can’t beat fresh! Thanks for sharing your experience. I am eating a very delicious Oskri coconut/pineapple bar that I purchased at a yoga studio. Halfway through it, I decided to look at the nutrition facts. Serving size one bar and it’s 75% of my daily saturated fat value. I’m horrified! It tastes good but I can’t enjoy it knowing it’s not good for me. The box says it is vegan and gluten free, and I felt it would be a healthy snack. No way. I’ll stick to coconut macaroons, the recipe I use has to be healthier than these bars. Thanks for taking the time to comment and sharing your firsthand experience! I regularly buy the bars, chocolate coconut and flaxseed ones. I find them delicious and not overly sweet. I am not an expert at figuring out what the ingredients are and the order in which they are supposed to appear. I trust the makers. I eat them between fitness classes because they are easy to carry and small enough to put in my gym bags. They give me enough energy until my next regular meal. No complain about the products at all.